“Bring more diversity into the media” is the motto of the New German Media Makers. In an interview, their Deputy Chairman, Chadi Bahouth, explains why the perspective of immigrants gets the short end of the stick in media coverage and how the association wants to change this. Mr. Bahouth, in the New German Media Makers’ image film it’s said: “Germany has grown more diverse, but the media hasn’t”. Your association is committed to a stronger presence of immigrants in the media. Why is that so important? Our society has become diverse, a country of immigration. That’s why it’s necessary that really all the different population groups, including of course those with a history of immigration or disability, have a voice in the media and thus also in society, both in front and behind the scenes, so as to be able to tell their version of history and expose stereotypes. Our democratic society lives essentially from what is reported in the media. And precisely immigrants often have the feeling that they are represented there in clichés or negatively. The New German Media Makers were founded in 2009 as a lobby for media workers with an immigration background. Who is behind it? A few years ago some colleagues realised “I have a difficult position in my editorial team with respect to certain topics”. It was out of this need – to change something, to strengthen one’s own position – that the idea emerged of founding an association. The name “New German Media Makers” is a very clear indication that we see ourselves as part of this society. We’re Germans – with a bit “extra”; for example bilinguality and an understanding of other cultures. We work in German, and some of is speak German better than our original language. This is essentially different from the ethnically formed associations of our parents’ generation. Your association wants to be a contact point for intercultural journalism. How do you encourage journalists with an immigration background? Dr. Chadi Bahouth | Photo (detail): © Private With the Bildungswerk Kreuzberg, which we founded in 2009, we started a cross-media, bicultural journalistic training centre for people with an immigration history. I myself was in the first-year group. It’s an intense programme in which you acquire all the basic skills of journalism and work very practice-oriented. In addition, the association does traditional lobby work and is committed to the goal that more positions in the media should be occupied by people with an immigration background. With good reason: every fifth inhabitant of Germany has an immigration background, but only every fiftieth journalist has non-German roots! How in your experience are journalists with an immigration background received in editorial teams? I think that in big cities origin usually doesn’t play a role. In small, local teams this looks quite different. A few years ago 87 per cent of local print editorial staffs didn’t have a single employee with an immigration background. It may even today be much more difficult there for someone with an immigration background to assert his opinions and perspectives, which in larger newspapers in Berlin, Hamburg or Munich would be accepted as a matter of course. “We’re not the better journalists, but also not the worse ones” it reads on your website. What “plus”, what strengths, do journalists with an immigration background have? Bilinguality is surely a great advantage, not only linguistically. If you’ve grown up in Germany with a foreign background, you’re almost inevitably sensitized to different cultures. Understanding for the situation of certain people, the access to certain communities, is simpler. I think that a colleague with an immigration background brings another perspective on subjects into the team. The association is engaged in numerous events, projects and initiatives for balanced reporting and opposes discrimination and hate on the internet. A task that, in the face of a rapidly growing development, seems like a fight against windmills. Hate is another form of fear. Our society is undergoing a transformation process, and this makes many people afraid because they don’t know how to deal with it. Then you have a populist party like the Alternative for Germany that says: “The refuges are to blame”. In this way hate and anger has been exacerbated in the social networks. That’s why our association actively takes part in the “No Hate Speech Campaign” of the Council of Europe. We want to sensitize especially young people and people working in the media to the treatment of discrimination in online media and social networks, and to show them how they can defend themselves against it. We want to send a signal against hate. 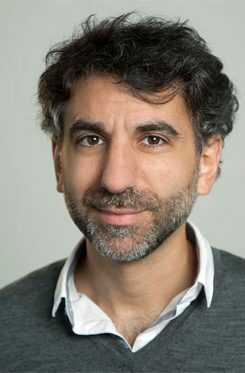 Dr. Chadi Bahouth, who has Lebanese-Palestinian roots, is a freelance journalist, lecturer, political scientist and Deputy Chairman of the association New German Media Makers. As a journalist he has worked as an editor and moderator for radio and print/online publications. His focus is on immigration, integration, international relations, the Middle East conflict and resource conflicts. conducted the interview. The freelance print and radio journalist was born in Poland and has lived in Berlin since 2009 and works at the radio station Funkhaus Europa. Copyright: Text: Goethe-Institut, Monika Stefanek. This work is licensed under a Creative Commons Attribution – Share Alike 3.0 Germany license.